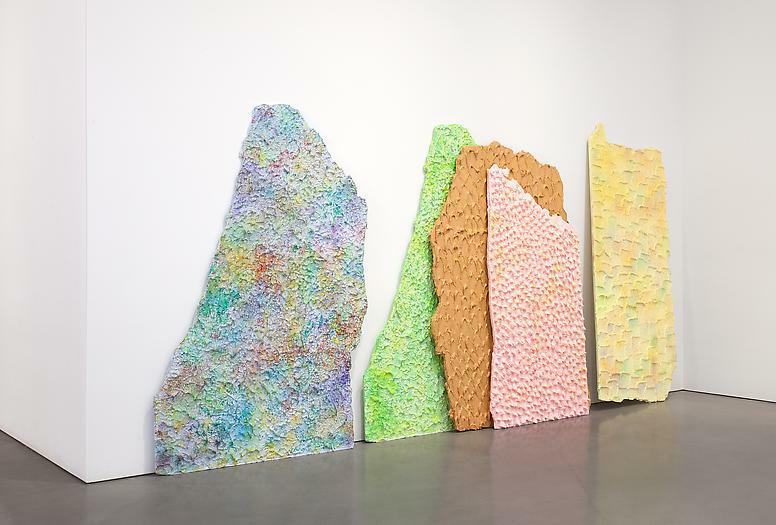 For Mika Rottenberg’s current exhibition at Magasin 3, she produced an impressive and arresting group of sculptures — cast resin and hand-painted textures that seem to have been ripped from the walls of one of her film sets. 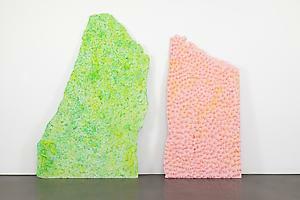 These sculptures reference an iconic tactility that is key to all of her films and installations. 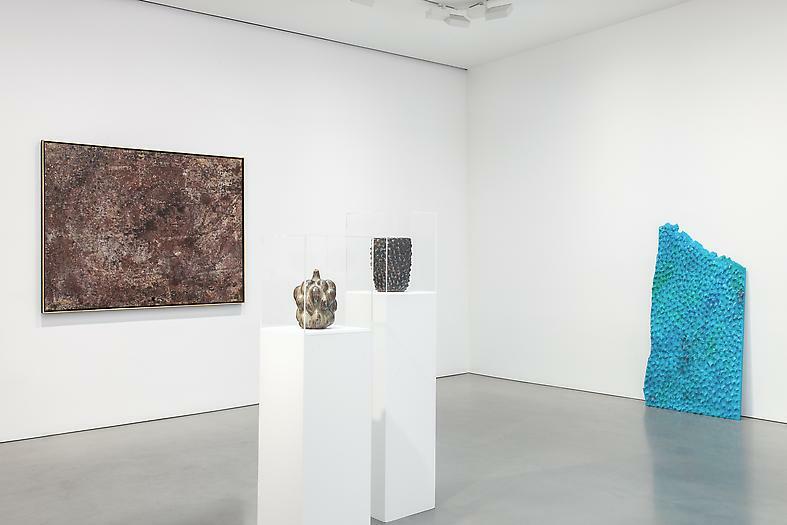 Since Gallery 2’s program is committed to encouraging alternative modes for understanding new and historical material through filters that may alter our perception, Andrea Rosen Gallery is delighted to announce a complex new group exhibition that juxtaposes Rottenberg’s sculptures with the evocative surfaces of works by Lynda Benglis, Sean Bluechel, Jean Dubuffet, and mid-century ceramicist Axel Salto. 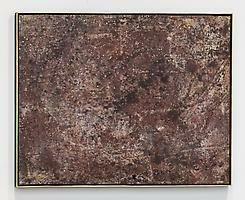 An important painting from Dubuffet’s Texturologie series avoids all figuration, but is not abstract. Literally a vast view of the ground seen from above, the gestural and gritty painting was intended to evoke a continuous, infinite space beyond the fragmented sphere of human action and intervention. Sean Bluechel prefers this dysfunctional arena, and his “Drunk Photos” engage multiple iconographies of sexuality, race and gender with a rough, physical sensibility. Axel Salto experimented with wild, organic forms and colors that were a radical departure from the prevailing, cool abstract styles of modern ceramics. 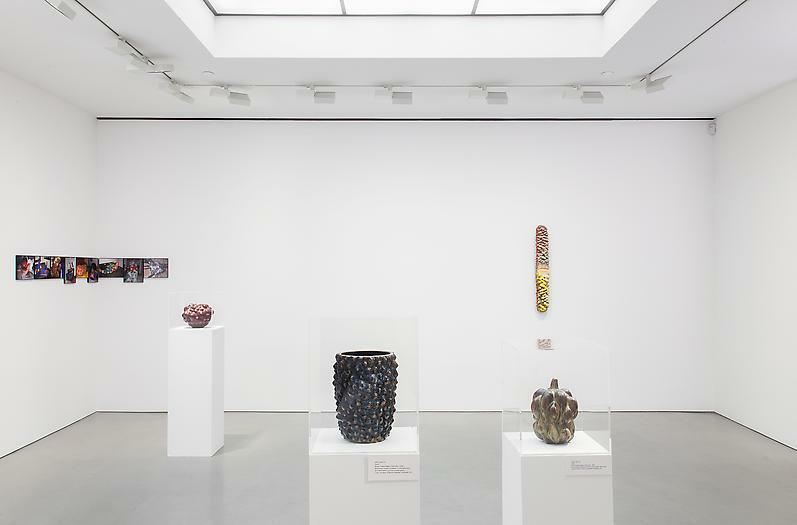 Although his vessels are undoubtedly decorative, Salto was a trained painter fixated on formal problems – how does the thickness and sheen of a glaze change as it slides over bumps and into grooves? 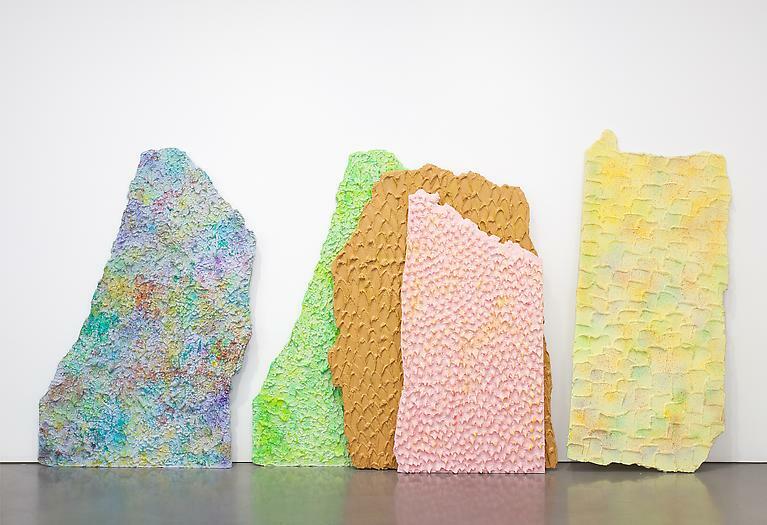 The dense, multi-colored accretions on Lynda Benglis’s wax paintings are sensuous and visceral, but they are also ground-breaking, transitional pieces that demonstrate the artist’s struggle to redefine painting and the relationship between the artwork and viewer in space. Lynda Benglis was born in Lake Charles, Louisiana in 1941 and received her BFA from H. Sophie Newcomb Memorial College at Tulane University in 1964. Her work has recently been exhibited at Modern Museet, Stolkholm (2012), Metropolitan Museum of Art, New York (2011), New Museum of Contemporary Art, New York (2009), and Museum of Contemporary Art, Los Angeles (2009). She currently lives and works in New York and Santa Fe. Her work is in numerous permanent collections including the National Gallery of Art, Washington D.C.; Whitney Museum of American Art, NY; the San Francisco Museum of Modern Art, CA; and the Solomon R. Guggenheim Museum, NY. Sean Bluechel was born in San Francisco, California in 1969. He received his BA from the San Francisco Institute of Art and his MFA from Yale University in 2003 and currently lives and works in New York. Recent exhibitions include Nicole Klagsbrun Gallery, New York (2013), Salon 94, New York (2011), and Greater New York at MoMA PS1 (2005). 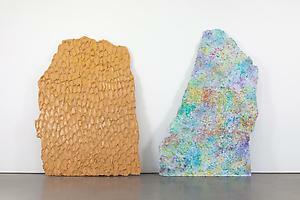 His work is included in the Julia Stoschek Collection in Dusseldorf. Jean Dubuffet was born in 1901 in Le Harve, France and is widely known for his contributions to Art Brut in the immediate post-war era. His first solo exhibition was held at Galerie René Drouin, Paris (1944), followed by Pierre Matisse Gallery, New York (1947). Major retrospectives include Musée des arts décoratifs, Paris (1960–61), Museum of Modern Art, New York (1962), Palazzo Grassi, Venice (1964), Tate Gallery, London (1966); and the Solomon R. Guggenheim Museum, New York (1966–67). 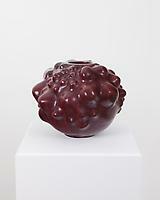 His work is included in permanent museum collections around the world. Dubuffet died in May of 1985 in Paris. Mika Rottenberg was born in 1976 in Buenos Aires, Argentina. Raised and educated in Israel, she relocated to New York ten years ago, where she now lives and works. Her work has recently been shown at Magasin 3 Stockholm Konsthall, Stockholm (2013), Nottingham Contemporary, Nottingham, and FRAC Languedoc- Roussillon, Montpellier (2012), M-Museum Leuven, Belgium (2011), De Appel, Amsterdam (2011), and San Francisco Museum of Modern Art, San Francisco (2010). Her work was also exhibited at the Whitney Biennal, New York (2008), Guggenheim Bilbao, Spain (2008), Tate Modern, London (2007) and MoMA PS1, New York (2005). Her work is held in the collections of museums such as Astrup Fearnley Museum of Modern Art, Oslo (NO); Fonds régional d’art contemporain (FRAC), Languedoc-Roussillon (FR); The Solomon R. Guggenheim Foundation (USA); La Maison Rouge, Paris (FR); Museum of Modern Art, New York (USA); Julia Stoschek Foundation, Düsseldorf (DE), and San Francisco Museum of Modern Art (USA). Axel Salto was born in Denmark in 1889 and trained at the Copenhagen Academy of Art, where he developed the ceramic style he is most known for. Counted as one of the masters of Danish design, his decorative ceramics at times defied functionality and were often sculptural. 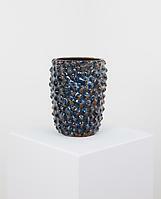 From 1923-29 he worked at Bing & Grondahl and later at Royal Copenhagen, further experimenting and developing his style. He was the recipient of a number of awards during his lifetime, including the 1937 Paris World Exhibition Grand Prix and the 1951 Milan Triennial Grand Prix. He died in 1961. Andrea Rosen conceived Gallery 2 in 1999 as a liberating arena in which to consider new ideas and create parallel perspectives to the Gallery's primary program, and as a means of fulfilling the Gallery's responsibility to broaden visual references and education for its audience. 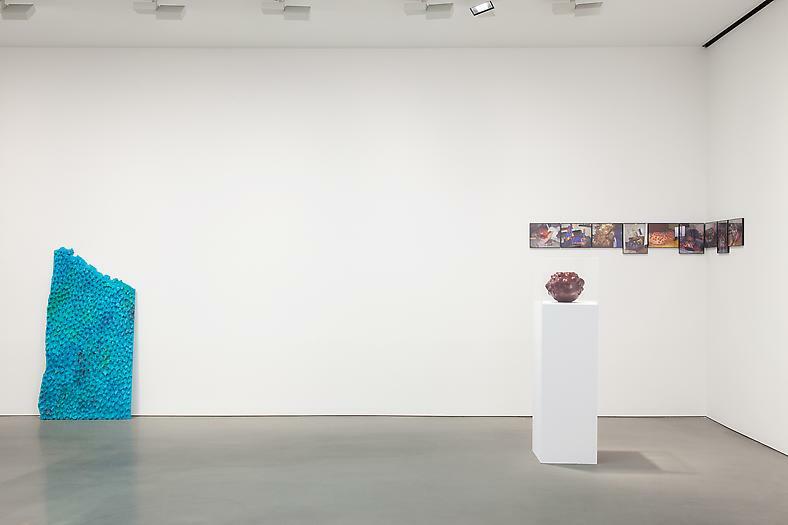 An inspiring and highly important part of the Gallery's exhibition program, Gallery 2 was formerly located adjacent to the main gallery at the 525 West 24th Street location, prior to the recent opening of separate Gallery 2 space at 544 West 24th Street. Gallery 2 has developed a reputation for significant historical exhibitions, presenting first-time, one-person shows, and shedding light on lesser-known aspects of prominent artists' practices. 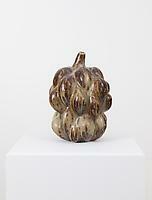 For press inquiries, please contact archive@rosengallery.com and Michelle Finocchi at michelle@michellefinocchi.com. The Rose Art Museum at Brandeis University, Waltham, MA. Published on the occasion of Mika Rottenberg’s retrospective exhibition at de Appel Arts Centre, Amsterdam, this first publication on the acclaimed young artist presents a comprehensive overview of her work to date. It includes extensive sections on all of Rottenberg’s major video installations, culminating with “Squeeze” (2010). Video stills, diagrams, drawings and previously unpublished source material are interwoven with essays investigating the work from political, philosophical and historical perspectives. Viisit the Project Projects website here for images of the book. Loan courtesy of Bernd Goeckler Antiques, Inc.